Click image to enlargeLeviton Decora Smart Wi-Fi Plug-in Outlet, Motor loads up to ½ HP including Appliances, Lamps, Fans, Fountains, and More. Works with Amazon Alexa and Google Assistant, No Hub Required. Start automating and controlling your small appliances, fans and motors using the Decora Smart Wi-Fi Plug-in Outlet. Use the free My Leviton iOS or Android app to add/name devices and to control them individually or as a room with a single button push. Create schedules, scenes and customize your experience as desired. Add an Amazon Alexa or Google Assistant device to use voice commands like, "Alexa, turn the floor fan on". Rated for motor loads up to 1/2 HP including appliances, lamps, fans, fountains and more no new wiring required. Leviton's Decora Mobile Device Station creates a convenient mounted location to charge a portable. The station attaches to a power outlet wall plate in three different mounting configurations. The simple open design allows for easy installation and maintains the touchscreen functionality of the device while in the cradle. The Mobile Device Station's flexible polycarbonate design. Fits most smartphones and portable music players. 15 Amp Tamper-Resistant Slim GFCI Receptacle/Outlet with Black & Red Buttons Peace of mind, all the time. The SmartlockPro Self-Test GFCI tests itself even if you forget. Designed to meet the latest UL standard for auto-monitoring (self-test) our complete line of self-test GFCIs periodically conduct an automatic internal test to confirm that it can respond to a ground fault. 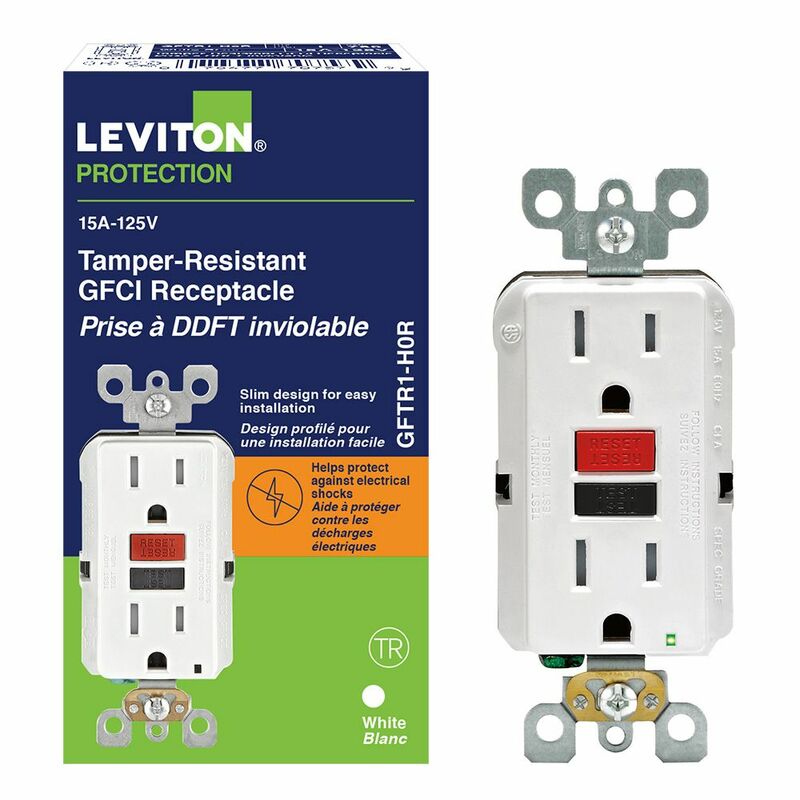 With the slimmest profile on the market, the device allows for fast and easy installation, while Leviton's patented reset lockout mechanism prevents reset of the GFCI if it is not wired or operating correctly. The SmartlockPro Self-Test GFCI is the smart choice in ground fault circuit interrupter protection. 15 Amp Tamper-Resistant Slim GFCI Receptacle/Outlet with Black & Red Buttons is rated 1.0 out of 5 by 1. Rated 1 out of 5 by WoodGal from Never Again! This receptacle lasted 3 months then the 'flashing' red light started....had to have electrician replace it $$$ ...not a happy camper and will not buy this brand again!